I learned about ripping out quilting stitches, too, but here is where all my years of being a seamstress paid off-I knew an easy way to undo-snip each 5th stitch from the top and when you have done that for about 10" then you pull the bobbin thread and the top stitches just pop out, then you repeat for the next bit and so on-I had about 30" to rip is all before I saw my problem so it wasn't too bad. All part of the whole-it is going to happen so learn to just do it! Just pulling it off the frame-I did turn the quilt once the center and top and bottom border was finished because I wanted to do the long side borders easily and in a particular direction-I pinned it right back on the leaders and it sewed up just fine-I am learning so much and love it! Went to the Putnam County Fair this afternoon and decided that I am going to enter a few quilts in the competition next year. 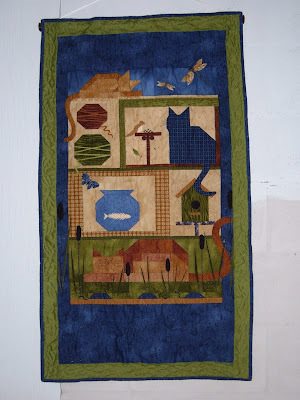 I have never entered a competition before, but there were many machine quilted entries and I would like to be one in 2009! 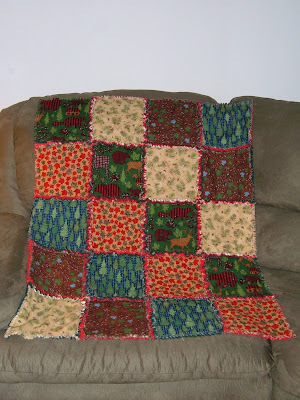 Here is a fun project we have worked on this week; a Rag Quilt. My Mom received the Christmas flannels as a gift and wanted to put them to work in a quilt. The back is solid red and green in checkerboard layout. Since it is put together with the seam allowances exposed, it takes some getting used to sewing it up. 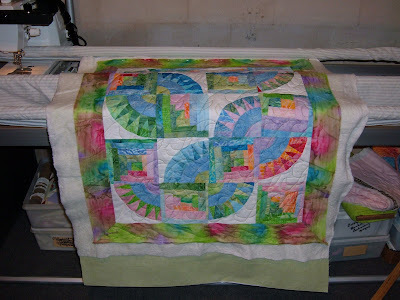 Mom used free motion quilting in the center of each block and clipped all the seam allowances, then we tossed it in the washer and dryer-WOW! 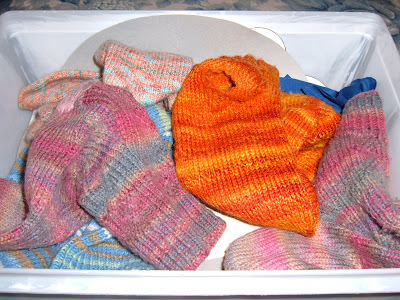 It is an easy process and I think the next attempt will be made of baby flannels! 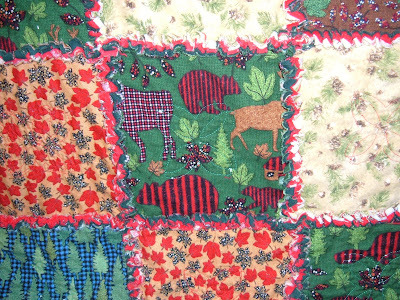 This is a close-up of the blocks so you can see the fringed seams-wish you could feel how soft it is! The guys have cleared the timber-mess a neighbor left in our front view at my parents' place. Bill just drives his tractor over and they made pretty quick work of it. 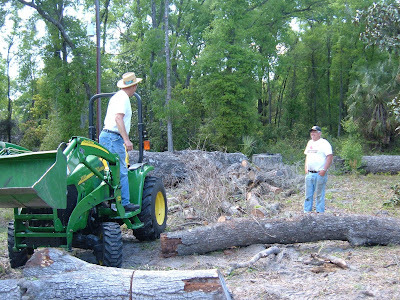 The wood is very dense-it was a Live Oak tree he cut down-we mourned the loss of the 2 beauties but they were not on our property so there wasn't much we could do. He left the mess there for over a year so we were glad to finally talk him into letting us clean it up! 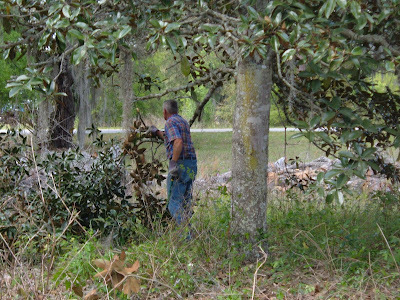 My Dad is a regular Energizer Bunny-while they were cleaning up the brush, he took the opportunity to trim up the lower branches on the Magnolia tree so that it can be mowed under. 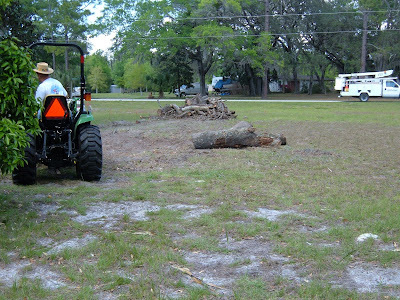 Bill cleaned up the area with his tractor, smoothing out the sand and dragging the branches to the big pile. 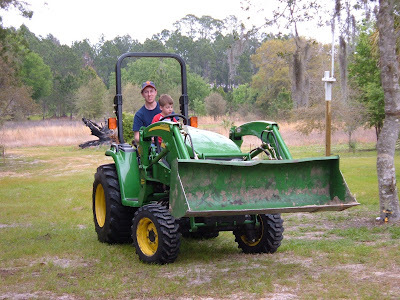 He is truly an artist on the tractor-he has a gift for visualizing contours and it is fascinating to watch him. There are two large piles of wood-Bonfire anyone?! 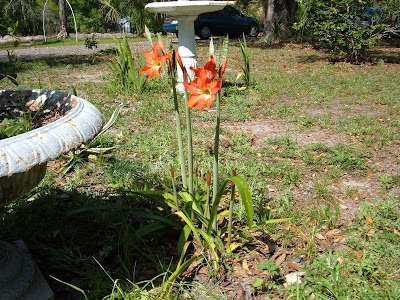 In our yard-all the Amaryllis bulbs we planted are coming into bloom-they are spectacular! 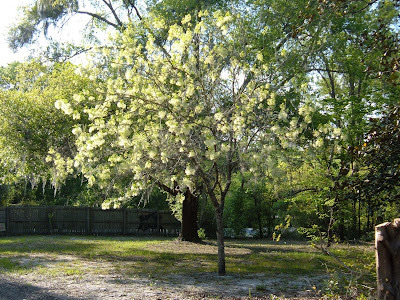 And here is another beauty, our Fringe tree towards the end of the driveway is in full bloom. It looks like a dead tree for the winter but over just a week it blooms into this-the aroma is sweet, too, which is a bonus. 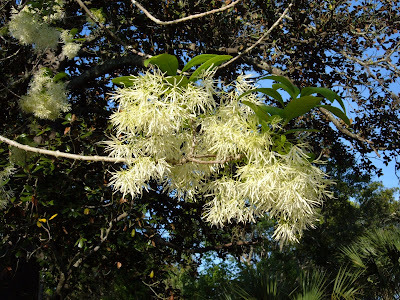 This close-up of the bloom shows you why it was named a Fringe tree-it is in the fig family-neat. Family, church, food, and a birthday! 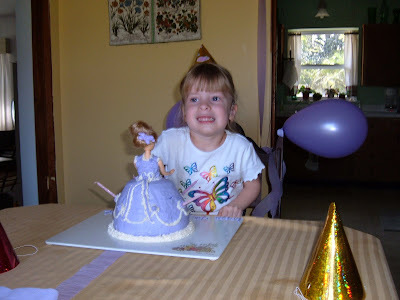 Abigail turned 4 and she had an audience to share her joy. 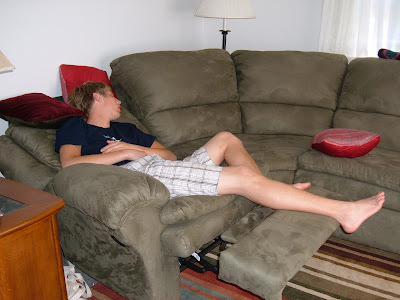 Uncle Caleb couldn't participate 'cuz he was in the sleep zone from being up all night sick. What better place to be when you are sick than at Mama's........ 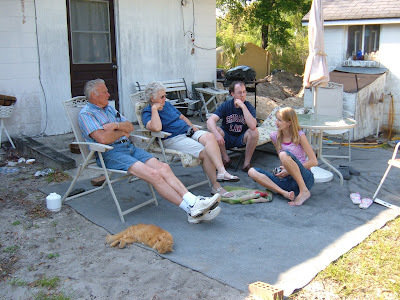 Here is the rest of the family just relaxing while the kids did their thing. 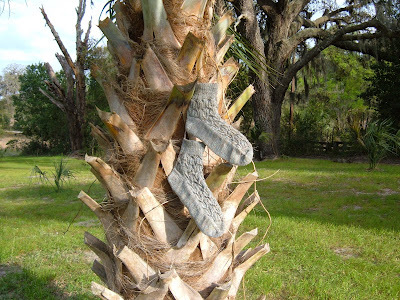 We were remembering a bit chillier hunts in years past-Marsel remarked she never found any candy at the foot of a palm tree! 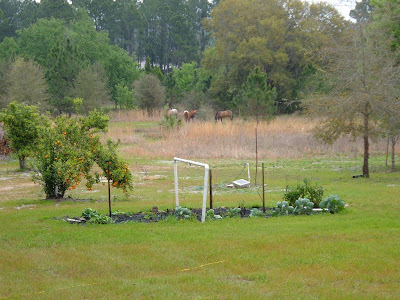 This is what we had for an early morning adventure-a neigbors horses escaped and visited the rye grass Bill has planted out back for the deer. 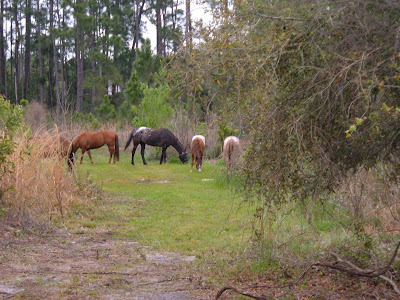 The owners soon caught up and took them back to their own pasture.....the grass is always greener on the other side! 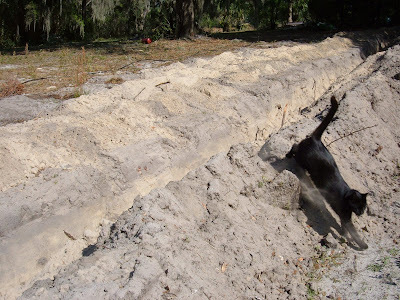 The men gathered around to finish digging the ditch to connect the water from the well to the house (it will house the water pipe and the wiring-no freeze level worries here!) 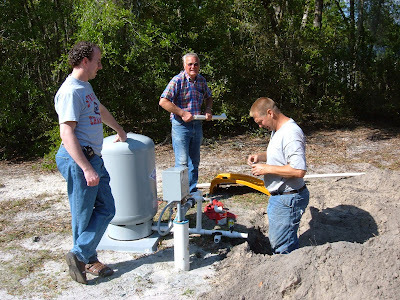 Bill, my Dad and son-in-law , Bruce are at work. Tom comes running when he sees me-he likes to be in the middle of the action, but being separated from me was too much-he made the 4' jump to be with me-a real RinTinTin moment!Notice the guys just kept on working when they saw me but that is another story! Here is the fruit of Tuesday's sewing day. 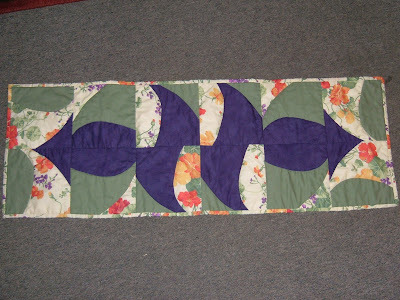 Mom and I taught each other how to do freeform cutting and curved sewing. We made 12 blocks to sew into a tablerunner. It was a bit intimidating to cut and sew free form but wonderful to cut the oversized blocks which come out a bit crooked and then when we squared them up-wow-it looked like we had sewn these amazing curved blocks. Who says it is hard to sew curves..........this was a breeze. While we were in sewing, the guys were up on the roof taking down an old, unused chimney-they broke it up, tossed it to the ground and then loaded it on the tractor bucket to take it out back to use for fill. A productive day all around-oh, yeah, lunch was out on the patio, BLTs and a balmy 80 degrees made for a nice backdrop. I finished my first wallhanging on my Inspira Quilting Frame-so fitting to have it be a cat quilt! I threw it in the wash and love the way it turned out-I am afraid most of the quilting detail is lost in the picture but it looks lovely in person-now on to a 'real' quilt project! 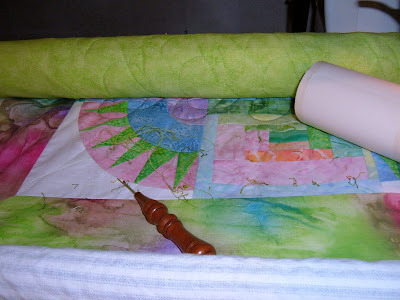 My style of quiltmaking is to make the new look instantly 'old' by never washing my new fabric, only use cotton batting, do close machine quilting, hand stitch the binding and then always toss it in the washer and dryer for the finishing touch! Just love it every time. ...........of socks with blown heels. I have in times past darned them but it isn't lovely to look at and it feels like there is a wool wad under your heel; so these sit in the bin and they wait for me or the moths. What do you do with your socks that lose their initial perfection? I am tempted to try and needle felt the holes with a bit of roving and a styrofoam ball-what is your guess as to the outcome? 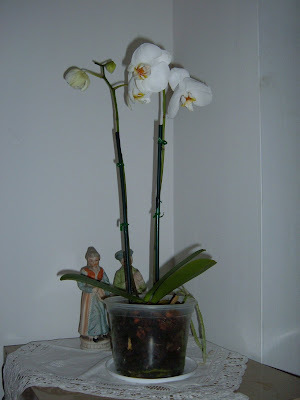 Here is the treasure I found at a garden nursery at the Flea Market on Saturday; a Phalaenopsis Orchid. We already have a common orchid that is growing well outside requiring little care or attention and so I thought I would try my hand at this one-it is not supposed to be fussy either so we will see. It is easy to see why these are such favorites for it is a thing of beauty. And lastly, we ate the last Ruby Red grapefruit for lunch today! It was as wow as the one we ate the other day-but this one I did manage to photograph before we enjoyed it-peeled and eaten just like an orange, it is so sweet, it requires no doctoring up with tons of sugar! Our little tree in the backyard has about a dozen buds on it for a promising new harvest. 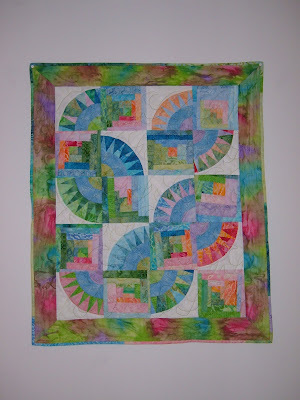 Was able to spend a good chunk of the morning machine quilting my first project on my quilting frame. It was wonderful good fun and all I hoped it would be. 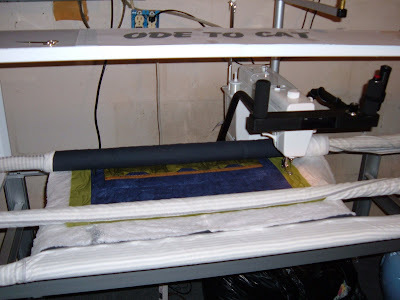 I was able to try pantograph stitching, stitch in the ditch and free motion stitching to 'get the hang of it'! I'm hooked! As you can see, my trusty project buddy was there every step of the way! As I unrolled it from the frame so I can finish the binding (Monday's project) it made cool noises that Bling just couldn't resist. At least he didn't sit on the shelf or frame-just watched me from over my shoulder. 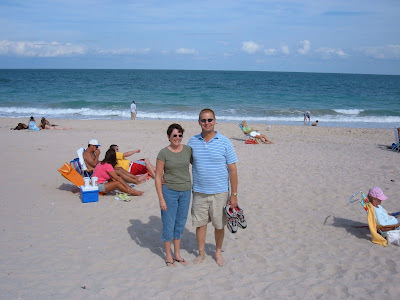 Heading off to Daytona with Mom and Dad for a Flea Market visit, a stop to Sears, JoAnns and IHOP-what a day on the town! This is a post that hardly needs words-if only I could share the smell with you! This is the first lemon from our Ponderosa Lemon tree-it is the only one for this season but there are three more growing for next year-can't wait! 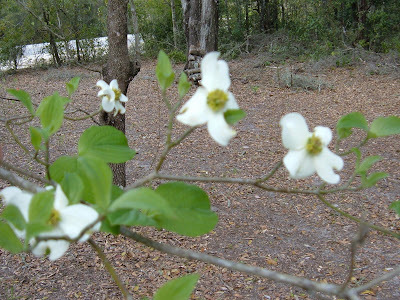 (The lemon of this tree grow to be supersized-everything grew bigger on the Ponderosa ranch I guess....hence the name of this beauty.) I saved the slices to use for garnish but squeezed the rest of the lemon for juice; it yielded a pint of juice just squeezing by hand. 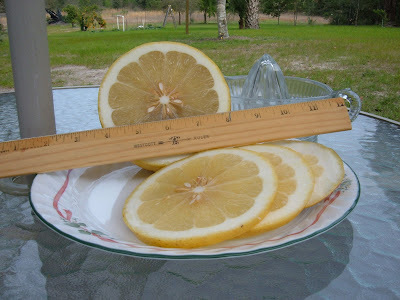 We are going to have lemonade for dinner tonight! We'd love to have you stop in for a glass! 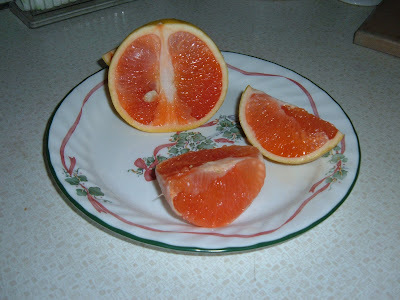 Bill and I also picked three Ruby Red Grapefruits from his tree-I normally don't like the sour fruit but I was pleasantly surprised by its sweetness-before I knew it, we had eaten the whole thing when I thought to take a picture, it was way too late. I will take a picture of one tomorrow just before we devour it! We had an easier trip to Georgia this time-no traffic jams; just good conversation and a missed exit and a little side trip in the fast lane. Nothing a little detour couldn't cure! 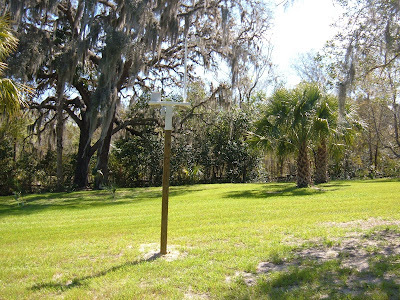 The weather here in FL was in the high 70's...the weather there was cold and then colder-I have NOT missed snow yet-the kids were excited but my body did not like the shiver-mode! There was a bit that collected on the ground but not a real driving issue. 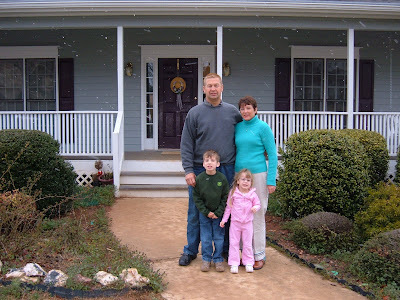 The guys took a trip to NC to Bruce's parents' home to pick up a china cabinet that matches Marsel's dining set. Marsel and I went to the Sewing & Quilting Expo! We had quite an inspiration of color and pattern and topped it off with a visit to a nearby JoAnn Fabrics store. This was to be an annual event but I missed last year so this was the second time we got to go and the show was a great Mother/Daughter day activity. 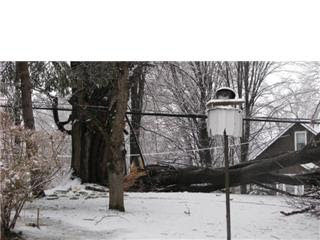 National Grid and an electrician finally restored the power a broken pole and blown transformer removed. My parents were again tempted to go home early (last year their furnace quit and they had to go home early to take care of that!) but have left the repairs in my sister's and brother's capable hands and will stay with us until their usual departure day-phew! We have sewing to do and projects to accomplish together, and........I am just not ready to say goodbye again so early!!!!!!!!!!!!!!!!!! 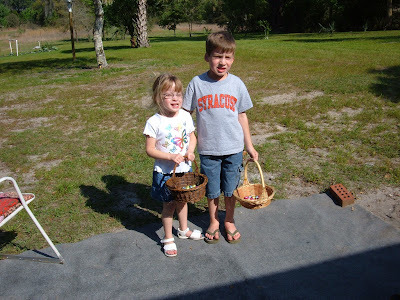 Speaking of sewing, Marsel and I made a dress for Abigail for Easter/her birthday which are the same day this year. It is so wonderful to sew a princess dress for the little princess herself-just wait 'til you see her in it! We also re-organized Marsel's sewing corner; I am telling you the organizing bug is contagious and I will gladly send it to you if you ask! Even her husband was pleased with the changes and he doesn't like change-"Wow!" was a great compliment from Bruce! 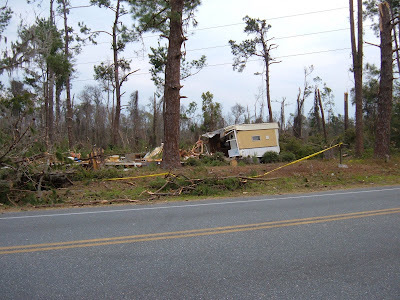 And finally , while we were getting flurries and my sister was getting snowed in, just an hour north from our FL home people were dealing with another kind of weather crisis-a tornado. 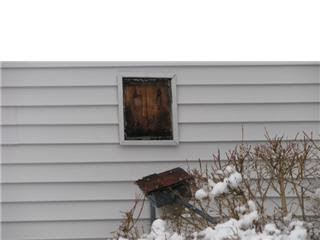 Here are a few of the 'AFTER' pics we took while driving through today on our way home. 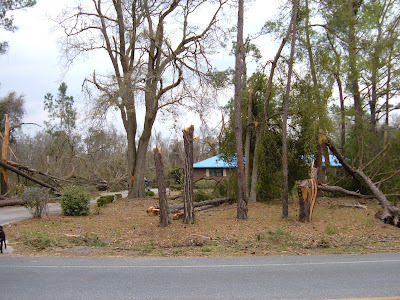 My parents said we just received a good, hard, windy rainstorm where we live, lot's of branches but not the damage that Lake City received. On a side note, my parents were out of power here for a few hours, too! How's it going? Do we take our 'electrical' lives for granted or what! 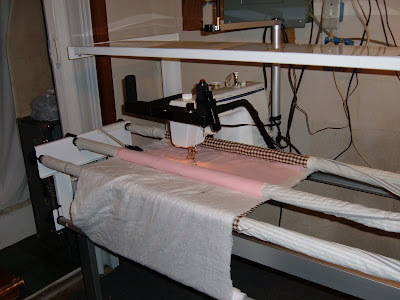 Just before we moved here to FL, I bought a Mega Quilter and frame to be able to do some serious machine quilting. 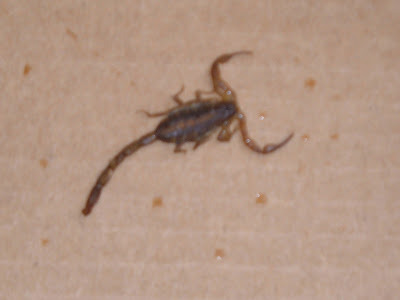 It has lived in our portable garage (the plastic shed we put up when we moved here a year ago!) 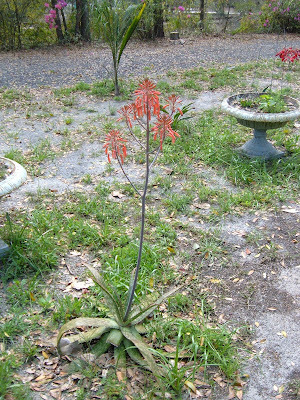 and I have looked longingly at it, watched the dvd and video and waited; something I am better at doing than I thought! Practice does make perfect! 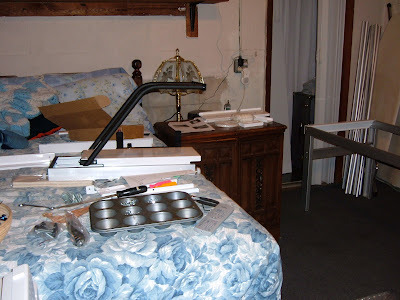 Yesterday, Mom and I did some major rearranging in the guest room; I did some major reorganizing and we made room for it, finally------it is large 10' long and 40" wide! This morning we put on the finishing touches and revved it up---->It is lovely! Now to practice so I can finish up a nice pile of quilt tops waiting to be birthed! Who says I am not teachable!? He was a gift from a friend and is doing well after his transplant. 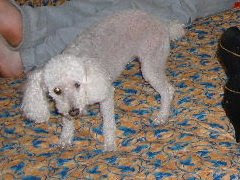 And finally, a farewell to our four-footed, faithful friend, Fifi who has livened our household for the past 13yrs........truly an end to an era. 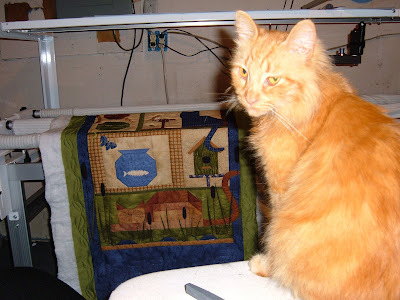 Helped Mom today..............it is such a sacrifice to sew with her! We were pleased with our afternoon's work. Here is another first of a different kind. 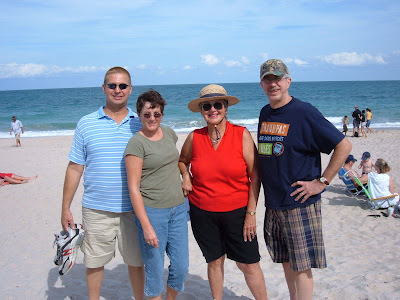 Today we drove a pleasant 3 hours south of our home to visit Bill's oldest sister and husband who are in Vero Beach. We went to lunch at an outdoor local Italian Festival, and enjoyed great food and a my favorite was the fried dough they called zeppoli. 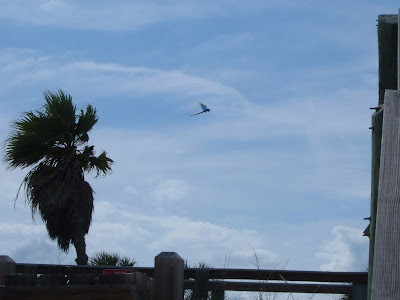 To work off the good food, we went to the beach for a vigorous walk and saw a beautiful dragon kite high above the crowd. 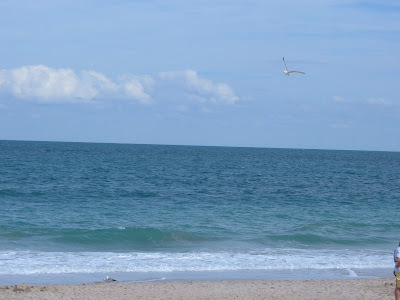 The water is much deeper there than at our beach producing the more tropical shades of blue; also the shoreline was steeper but walk we did and caught up on each other's family news. 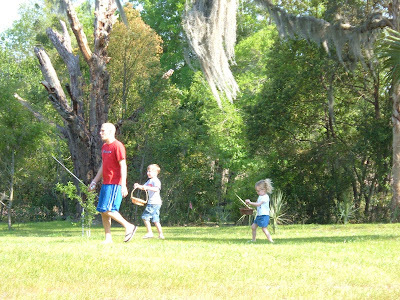 Later we went back to their condo and played Wahoo. They had never heard of the game but were willing to learn-it brought back good memories of long ago when Bill and I were just dating and very often would spend an evening of games and good food with them. By the way, the guys took the first game but we did manage to come out ahead in the second! Thank you for the invite sister-in-law; we had a wonderful time!